We often find ourselves in Downtown Opelika when we make trips to see our children at Auburn. For a while, I was paying particular attention to work being done on an old building on 8th St. in the heart of the city. I was impressed by the attention to detail as the building began to take on character that could easily place it in the French Quarter of New Orleans. I was seeing lots of old brick and gleaming wide wood boards, arches and lanterns and an upper level balcony overlooking the street. I saw some workers in the place one day and, being nosy, I stopped by to chat with them and find out more about plans for the building. The gentleman I spoke with invited me in and talked to me as he polished wood and brass. I asked him what kind of business was going in the old place and he said owners of the restaurant, Zazu Gastropub, formerly located in downtown Auburn, had purchased the building and planned to move the restaurant to the Opelika location. I left, thanking my host for letting me glimpse inside the building and for the information and I made a mental note to come back to visit when the restaurant finally opened. I looked up the word Zazu, because I was interested in why Chef Graham Hage chose that particular name. I found a couple of different meanings, both of which I found apropos. First, Zazu is a Jewish name meaning movement. Pretty applicable considering Zazu has been in three locations. The Urban Dictionary defines Zazu as spirit and passion with flair and pizzazz. 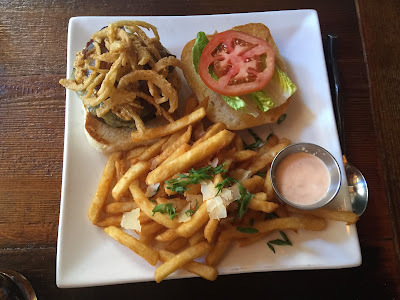 When I finally found myself enjoying the delicious food at Zazu, I thought that definition matched Zazu perfectly. My visit coincided with a trip to Auburn to watch a basketball game with our lifelong friends, Greg and Malinda. Of course, we always take the opportunity to see our boys. So, with the two of us, that was our group of 6 the day we visited Zazu. We were seated at a table in the sunken dining area just below the bar. Since there are only a couple of tables in that area, it is a quite private and intimate place for a small group, especially if your group is the only one in that space, as ours was. We quickly ordered our drinks and appetizers and we were very happy with all of them. Greg asked if the bartender could make a jalapeño margarita. He certainly could and he did! It was beautiful and delicious! It was so good, I can't even remember the other drink we ordered! I remember it was good, but that jalapeño margarita was unique and amazing. Our appetizers were also extraordinary and delicious. To begin with, we had seared scallops, shaved jalapeños and red onions, roasted corn and corn hollandaise. They were incredible and quickly gone! These homegrown heirloom tomatoes, sprinkled with sea salt and cracked black pepper, were drizzled with basil infused olive oil. They were fresh, simple and perfect. Flash fried eggplants splattered with chipotle infused honey and a sprinkling of sea salt and crispy basil must have been wonderful, because they never made it to me. Fried pickles and jalapeños were also quickly devoured. They were crispy and not greasy at all and the homemade buttermilk dressing was the perfect dipping pool. Finally, we rounded our our appetizers with some crispy duck fat fries with house made gravy and white cheddar cheese curds. These were very popular! There is just something about a fry cooked in duck fat. Greg got a corn bisque that looked creamy and delicious. I regretted that I had not ordered it as well. After all those appetizers, you would think we did not need entrees, but remember we had two college boys with us. They can put away some appetizers, so most of us settled for a tiny taste of each one. As far as the entrees went, I surprised no one by ordering Mississippi catfish tacos with shredded cabbage, pico, salsa and fresh corn. I loved them! Several members of our party ordered cheeseburgers and more fries. The burgers were met with enthusiasm all around. 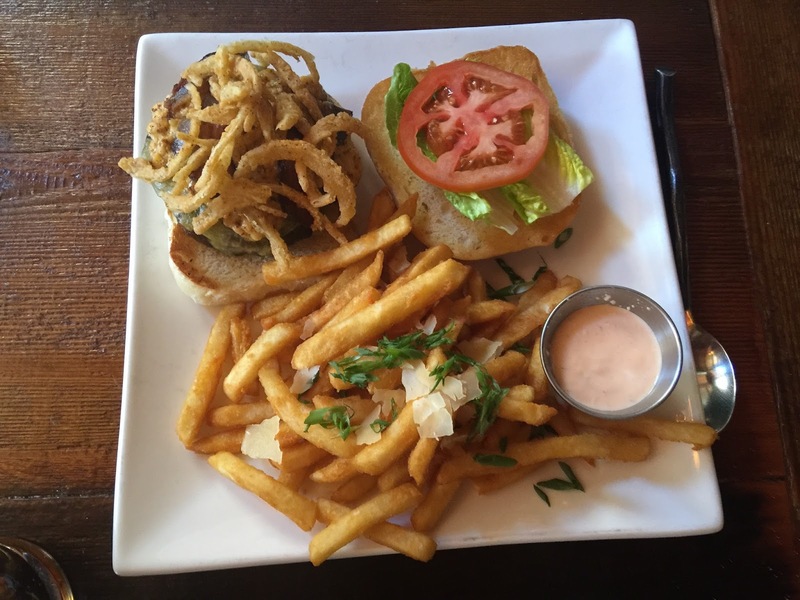 The beefy burger at the bottom was made with beef short rib and topped with Swiss cheese, Wickles and crispy onions. Scott is as predictable as I am when it comes to ordering. If there is a shrimp po'boy on the menu, you can pretty much expect him to choose it. It looked like everything you would want in a po'boy...crispy and lightly battered Gulf shrimp, lettuce, tomatoes, homemade tartar sauce on a fat French baguette. If I had not ordered the catfish tacos, I would probably have chosen the Bahn mi. It looked so good. With shaved pork, pickled vegetables, sambal mayo and shredded cabbage on a hearty baguette, it is just the kind of sandwich I love. Our visit to Zazu was lots of fun combined with delicious, cheffy food in a casual setting. We will definitely be back! 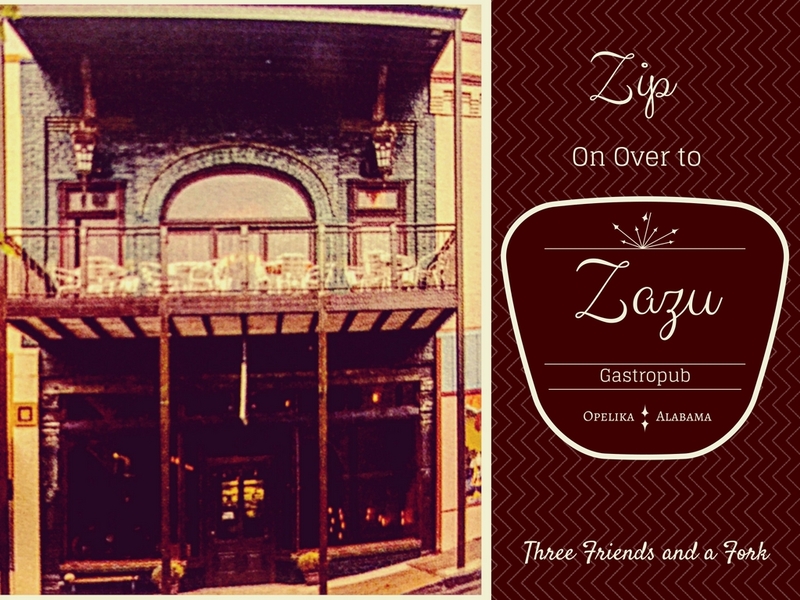 Zazu absolutely lives up to its name of spirited passion with flair and pizzazz. I haven't gotten to meet Chef Graham, but I hope to be back soon, and maybe I will get to tell him how much we love Zazu. 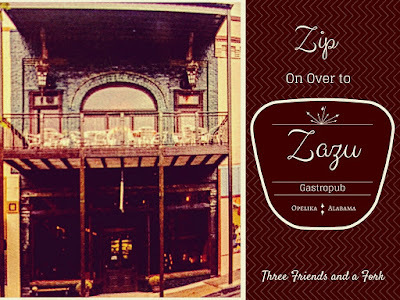 Three Friends and a Fork give 3 Zippy Yums UP to Zazu Gastropub!